Marella Discovery now visits IJmuiden quite often, here she is seen departing at the 2nd of september in 2018. The Nordic Empress was used as a reference for the placement of the public rooms of the new pair of ships that started the 'vision'-class of ships for Royal Caribbean. Four more ships in the vision-class followed in rapid succession afterwards, those became Grandeur Of The Seas, Enchantment Of The Seas, Rhapsody Of The Seas and Vision Of The Seas. In looks, those four are very different from the first two and they can also be divided into two duo's, due to tonnage differences. Because of the use of a lot of glass (that is why it was called 'vision') the passengers had great views all around these public rooms. This is especially visible in the two deck high area behind the nested lifeboats for the central lobby and the main restaurant. The Viking Crown Lounge, that was placed around the funnel at the Sovereign-class of ships, is moved down to upper-deck level, just in front of the funnel above the nine-deck high atrium. Because it is placed here, sunlight can enter the ship down through the atrium, called the Centrum at all Royal Caribbean ships. Also, the Viking Crown Lounge now was more easy to reach from the rest of the ship. The cabins aboard Legend of the Seas, the first ship of the pair, are also much bigger then on the previous ships, where the cabins have been kept small in purpose just to let the people come outside and get to the ships bars and shops. Just one year later, her sistership Splendour Of The Seas was delivered. She floated out in october 1994 and was named in Southampton by Lisa Wilhelmsen on the 29th of march 1996. Her first cruise started from this English port to Barcelona two days later. In her first year, she was employed in the Mediterranean. Around her introduction, the company re-structured itself too. The name Royal Caribbean Cruise Line was made plurar and became the name of the mothercompany of thwe line itself and its sistercompanies. The cruiseline became now known as Royal Caribbean International. This also stated that the line had outgrown the Caribbean and was from now on to be found in the rest of the world also. Below, a dramatic bowshot of the ship, taken when it was still possible to take pictures at the quay itself. You just could go through the warehouse that acted as a cruiseterminal and no one would ask you anything, if you would not try and board the ship itself. This was the 16th of august of 1998. 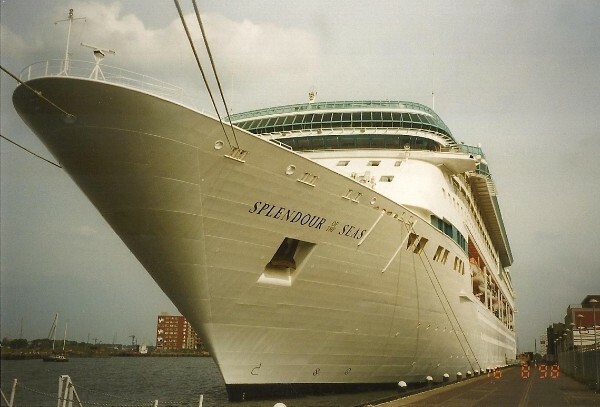 In her early years, Splendour Of The Seas had Oslo as her homeport and she sailed some northern-European cruises in 1998 to Norway, the Baltic, England and Holland. Later on, she was replaced by bigger ships in this growing market and she went to the Mediterranean and the Caribbean. In 2005, her homeport was changed from Oslo to Nassau, as most of the ships of Royal Caribbean that now lost Oslo as a homeport in general. Like her sister Legend Of The Seas, the ship gives the possibility of playing a game of golf on the uppermost aft deck, giving a spectacular view over the ships wake. If you do not care too much for golf, you can also try the rock climbing wall, also located on one of the highest decks. 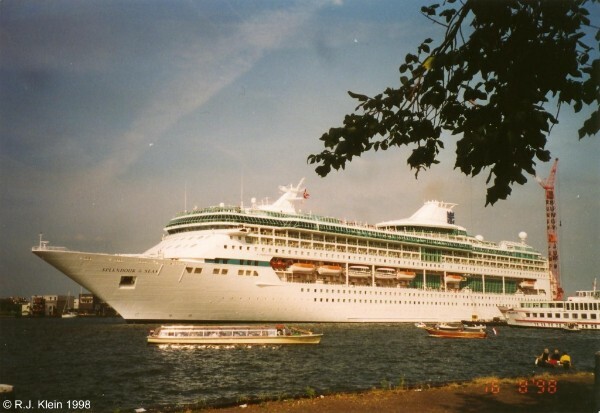 Below, Splendour Of The Seas can be seen departing Amsterdam at the same date as above. At the 2nd of may of 2015, it was announced that Splendour Of The Seas was bought by Thomson Cruises through TUI Travel Group, that is then owner of Thomson. The ship was added to the fleet of Thomson Cruises from the 2016 season onwards. In the Thomson fleet, she replaced the Island Escape under her new name TUI Discovery. Originally, the ship was to become Thomson Discovery, but because of the full intergration of the Thomson brand into the TUI orginasation, the name was altered just before the ship went into service. Another alteration followed again swiftly, as Thomson Cruises was rebranded as Marella Cruises by TUI in october 2017 to show the difference between the German TUI Cruises and the British Thomson Cruises ships. So TUI Discovery, who originally was to become Thomson Discovery now finally became Marella Discovery. For now.